Arag, Ast, Gal, faba, OCast haua, L. Vicia faba mino, Ar. bajilla or lūbīā, Fr. haricot (a variety of), Eng. broad bean, fava bean. It is believed that this legume, a native of Persia, was being cultivated by 2300 B.C. It spread through Egypt, Greece and Italy. It is not known if the fava bean is named for the Fabios, a very noble Roman family or visa versa. During their conquests, the Romans took the bean to other European areas for human consumption and as horse feed. In the Middle East, the bean was despicable food for shepherds and the lower classes. The Hebrews carried on this contempt for the bean, calling it commoner’s food. Later the Celts spread the use of the bean for which it has been referred to as the Celtic bean and was consumed all over Europe. In medieval Spain, Jews served it as a good cold snack on the Sabbath. 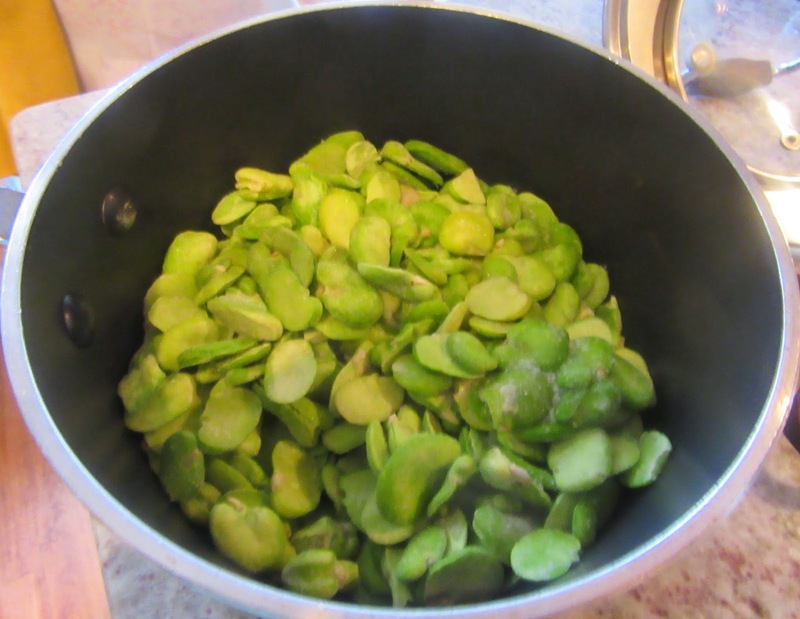 They celebrated the Passover and other occasions with broad bean dishes. In one of their recipes, for board beans is served as a sweet dish with almond milk. In Spain, they took on the good connotations like Jack’s beanstalk was the ladder to heaven. The bean became a lucky charm. In Christian Spain, the fava bean was not only good luck but also an object of jest. Several regions name a person to be King Fava, the equivalent of the Lord of the Fools, on December 28th (the European equivalent of April 1, April Fool’s Day, in the United States) or on New Years Eve. Traditionally he plays jokes on others or visa versa depending on the locality. At the same time, it is known that the kings of Castile were not jesting when they ate fava pottage. They truly liked it. 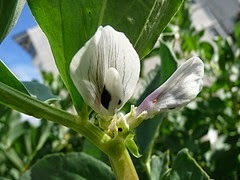 In Al-Andalus, the fava flower was one of the most treasured in Muslim gardens of the 11th C where the fava bean had become part of ordinary food. A household staple was broad bean pottage with chicken liver. 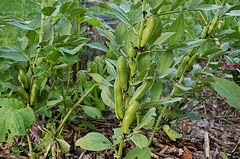 Four varieties of the bean were known at that time, black fava or bajema, the red or Egyptian, the white or Greek-Roman and the bachaly, which was grown in Babylon throughout the winter. They were used in narcotics and for attracting hunted birds such as crows and pigeons. By the end of the 13 C, the fava took on regional traits in cooking. Mixed with lamb, garum and vinegar, it was served as a puree or it could be left whole and combined with noodles or vegetables. 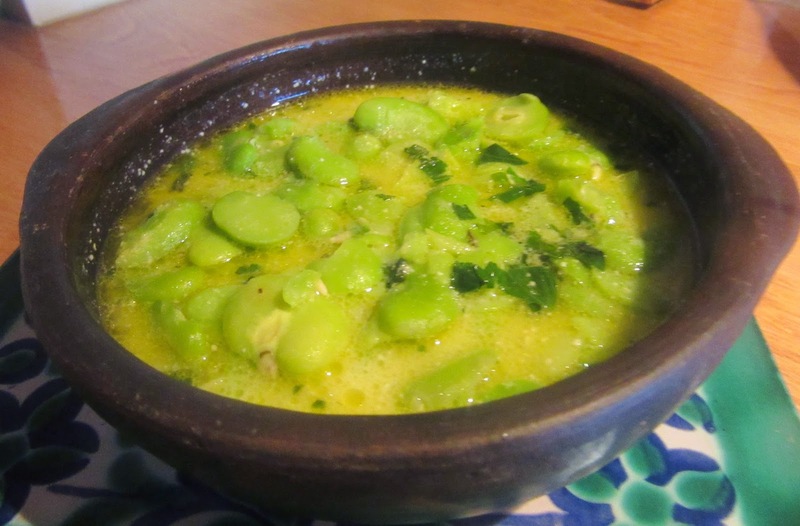 The Anón Al-Andalus gives two recipes for broad beans one with lamb, spinach and lettuce and the other is a mixed vegetable dish mixed with eggs and cheese. 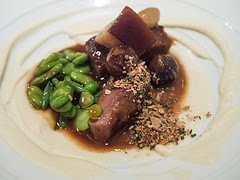 Fadalat gives a recipe for pureed fava beans with lamb. Sent Soví´s are mixed with almond milk. When in season, Nola uses almond milk or goat's milk in his recipe for “Royal Fava Beans”. In medieval England, fava beans and bacon were standard fare. The Ordiance of Pottage provides a recipe for a soup also containing leeks and other greens. The English celebrated Christmas with pork and beans. In the spring, they ate young beans with suckling pig. VOLT - "Pork and Beans"
As in ancient times, even today a handful of fresh fava beans signifies a meal for many. Favas and lentils have been as important as daily bread. 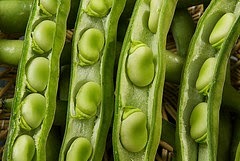 There are 12 species of beans in this legume family, some of which are green or French. This does not include beans of the Passels vulgaris family, natives of America and unknown to Europe until the 16 C. Although not as digestible as grain, fava beans contain more protein. Medicinally, the bean and the flowers were consumed for their diuretic properties. See fabada, judía and vicias. Boil almonds in water. Peel them and chop them in a food processor. Add 2 2/3 c vegetable broth and blend. Strain this through a cheesecloth into a pot. Wash the favas in hot water. Boil them in almond milk, olive oil and salt. Bring to a boil and reduce heat. Boil gently 4-6 minutes until tender. When almost cooked add finely chopped herbs, Duke’s powder and finally ginger scrapings and sour grape juice or vinegar. Add salt to taste. Serve in bowls. Se lava las habas con agua caliente y se ponen después a cocer con la leche de almendras, el aceite y la sal. Cuando estén casi cocidas se agrega el perejil, la mejorana y albahaca todo cortado a trocitos pequeños, así como polvoraduque. En el ultimo instante se incorpora el agraz y unas raspaduras de jengibre. If you want to prepare tender favas in almond mil kit is done like this: Frist take the favas and wash then in hot water. After that boil them in almond milk with oil and salt. When almost done add finely chopped parsley, marjoram and basil. Add duke’s powder. Finally add sour grape juice and ginger shavings. 1. Veg. Nota 1 al c. 115. Les últimes líujes de V. Núm. 58 són: “En aquesta manera pots axí matex adobar fabes tendres; pot-hi metra saliandre vert ab de bones espècies: pebre gingebre, canyella e safra”. B, tal com ha fet en el c. 114: en d’altres ocasions (veg nota 1 al c. 114), repeteix la recepta precedent, peró sense incorporar-hi les addicions suggerides. gingebre: B “ginbre”, errada evident.